Ceramic Material Unveiled at ARC - ARC Abrasives, Inc. Earlier in the month, we broke the news about our findings on a new grain that our team of engineers have been researching and analyzing in hopes of developing a new abrasive material. Among the discovery was mentions of various artifacts, such as an old clay pot with mysterious red triangles that form some sort of a peak, a resemblance to mountain tops. 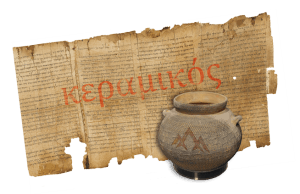 A very tattered scroll was wedged inside and upon unraveling, the word “κεραμικός” is etched in red. Upon further research, we learned the meaning of the term being “ceramic”, or “made of clay”. For many that may not know, it is a non-metal compound that is shaped and hardened by hot temperatures, and is corrosion-resistant. Ceramic is one of the oldest human technologies with many uses, and ARC Abrasives wants to put that to good use. Learn more about what this means in the video below. Upon further testing and development, we have discovered that while this ceramic material was formed via high-heat temperatures, it runs much cooler and has long life in comparison to other abrasive products. We put the material to test and the findings show that it was aggressive in stock removal, caused less smearing and removed any deformations caused by heat. If you are as interested as we are in learning how this ceramic material comes to fruition, please follow our updates via social and be along for the ride. Check out our social media pages on Linkedin and Facebook to keep up with our weekly ARC Abrasives updates!